Spoiler alert: The new Joanne Fluke mystery provides answers to the last few. Read the others first, or plunge into this one and suffer the consequences. It’s hard to resist the latest of Joanne Fluke’s Hannah Swenson mysteries: Between the cover and the title, Chocolate Cream Pie Murder offers a mouth-watering invitation into the life of a bakery owner who thought she’d married the love of her life. Hannah went on a great honeymoon (see Banana Cream Pie Murder), and then suffered the mysterious disappearance of her new husband (see Raspberry Danish Murder). But now she almost wishes he’d stayed gone! His reappearance comes with threats to her and a new side of his personality she hadn’t realized existed. Plus the whole town of Lake Eden, Minnesota, knows her marriage wasn’t legal after all: Ross was already married to someone else. So why is he back in town, and what does he actually want from her? Trapping Ross and stopping the chain of violence he’s triggered won’t fit well with making the cookies for the bakery (lots of recipes in here!). But it’s just what Hannah needs to let go of blaming herself and get on with recovering by the time she and her loyal friends solve the crime spree. Recipe caution: Fluke provides extensive directions for her recipes, making them a good choice for beginners. But about half the recipes involve pre-made mixes and artificial toppings, so if you’re particular about avoiding those, prepare to do many revisions. Still, one of the pleasures of this series is getting a clue to how new recipes are devised, especially the ones that connect to friendly community events in Fluke’s version of Minnesota town life. Fluke can also be relied on for solid basic investigations, without any high-tech testing or complicated profiling. 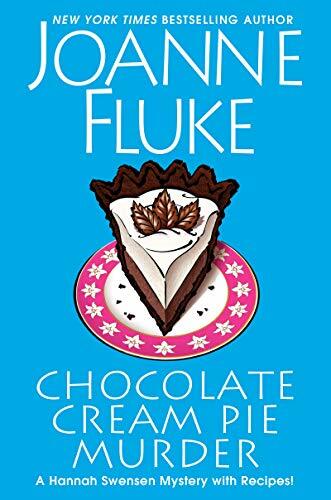 Chocolate Cream Pie Murder is an updated, country-style classic mystery, meant for simple enjoyment and a touch of admiration at how Hannah always picks herself back up again, even when there’s a body in her bedroom and a disaster in her bakery. It’s fine to read this one without having the rest of the series; plenty of clues and references to earlier plot twists arrive in a timely fashion. The only tough part about the book is the recipes can lure a reader into cooking something before reading the next chapter.